Unfortunately, the feature only works with the vzaar Flash player which means that information is not sent from the vzaar HTML5 player, rendering the feature less than useful for many customers who wish to gather data on viewer behavior for those viewing on non Flash-enabled, mobile devices. We've now created a mechanism which works with both the Flash and HTML5 players, meaning viewer behavior can be tracked for all viewers, including those using mobile devices. There is a little set up involved but it's straightforward and covered here. Note: if you are using this approach, you should disable the integrated GA feature or sent events will be duplicated. playerLoaded is a count of how many times the vzaar player has finished loading. frameGrabLoaded is a count of how many times the poster frame (thumbnail) has loaded. playbackStarted counts how many times the video/audio has started playing. Note: this will not be counted twice if a viewer resumes playback after pausing the video. pause counts how many times the video has been paused. resume counts how many times a viewer has resumed playing the video after pausing. percent (10-100) counts how many times this proportion of the video has elapsed. seekbar counts how many times the player seek bar area has been clicked. seekbarhandle counts how many times the player seek bar handle has been clicked. fullscreenon counts how many times the video has entered full screen mode. fullscreenoff is a count of the number of times the video has exited full screen mode. soundOff counts how many times the mute button has been pressed. soundOn counts how many times the sound has been unmuted. buffered (s) counts the amount of time the video has buffered (in seconds). If there are general Google Analytics terms that you need clarifying, take a look at their glossary here. 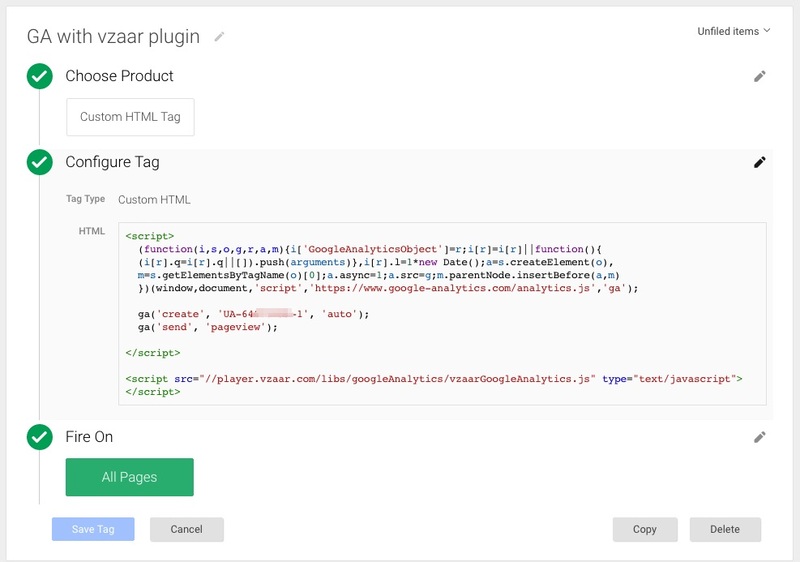 It is possible to load the JS via a Google Tag Manager tag, but it has to be in the same custom HTML tag as your Universal Analytics JS.